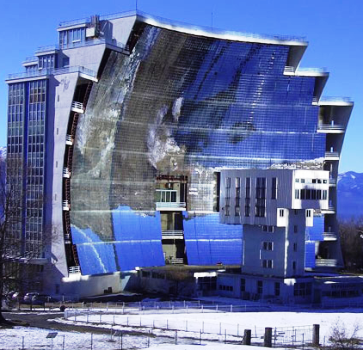 Even energy-intensive, high-temperature industrial processes can be supplied by solar thermal systems if concentrating solar technologies are used. The EU-supported Solpart project, coordinated by the French-based CNRS public research organisation, is investigating the deployment of high-temperature solar-heated reactors for the industrial production of calcium oxide or quicklime, a major cement ingredient. A 30 kWth pilot reactor, including storage, is planned to be constructed and analysed in CRNS’s solar furnace (see the photo above). A mirror field will heat up the reactor particles placed in the receiver tower to between 900 and 950 °C for calcination. Solpart was launched in early 2016 and will end in December 2019. Cement is the most widely used building material in the world. One of its key ingredients is calcium oxide (CaO), also called quicklime, which can be produced by calcination from naturally occurring limestone (CaCO3). Calcination is an energy-intensive, around-the-clock decomposition process at around 900 °C, usually powered by the combustion of coal or secondary fuels (e.g. used tires, or the burnable fraction of industrial or municipal waste). The aim of Solpart is to develop a solar reactor prototype that separates limestone into CaO and CO2. The heat for the particles will come directly from a concentrating mirror field without being transported by any heat transfer fluid. The project’s main challenge is in solar reactor development. Currently, there are two different designs being built in lab size (5 to 10 kW) at the participating research institutes. The principal achievements made so far are related to the measurement and modelling of kinetic data from decarbonisation as a function of temperature and particle diameters. The CNRS prototype is a fluidised bed reactor, which can be used for a variety of multiphase chemical reactions. 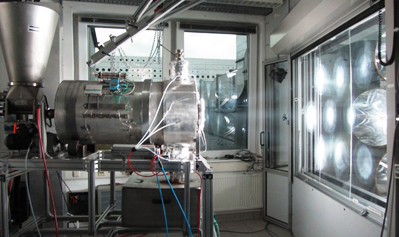 The German Aerospace Centre, DLR, employs a rotary kiln version to heat up the particles directly by solar radiation entering one side of the cylinder (see the photo below). Based on nearly completed simulations and measurements, there will be a decision later this year on which reactor to bring to a new prototype stage. When scaled up, it needs to operate 24 hours a day, show 30 kWth of nominal power for producing 30 kg of CaO every hour and include a 16-hour heat storage unit for 160 kg of particles and for delivering 10 kg of CaO per hour.